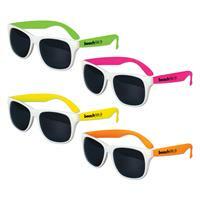 Our high quality, Iconic kids sunglasses have UV400 protection and are great for kids. Ideal for outdoor events, schools, travel agencies and event planners. Plastic. Available in assorted colors (WL734X), black (S70792X), blue (S70793X), green (S70795X), pink (S70797X), red (S70794X), white (S70796X). 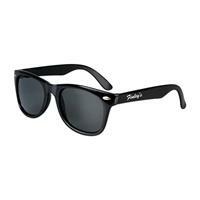 You'll be a singing sensation with these ultra cool Kids Blues Brothers style glasses! 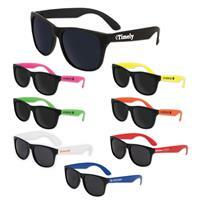 These black plastic sunglasses offer UV400 protection. One size fits most kids. This summertime staple makes a great promotional handout for beach themed events, company picnics, concerts and festivals. 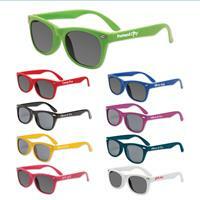 Customize these shades with an imprint of your company name and logo for maximum brand exposure. These glasses are also sold blank. Order yours today! 100% UVA & UVB protection. Item Size: Frame Width: 4 7/8"; Arm Length: 5". 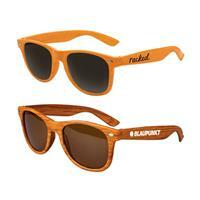 These high quality, Kid's "Wood Grain" Iconic Sunglasses have UV400 protection and look great with your logo! The lens disburses color from its edge! Ideal for outdoor events, schools, travel agencies and event planners. Customize with your company name and logo to advertise your brand while connecting with your customers. 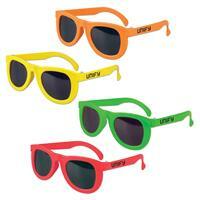 UV400 lenses provide 100% UVA & UVB protection. 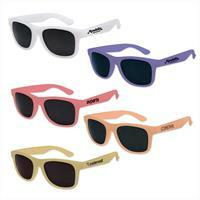 Item Size: Frame Width: 5"; Arm Length: 5". Available in Light and Dark Wood. A great pair of shades is a must! 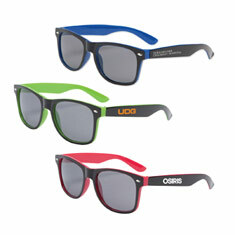 Our UV400 kids classic sunglasses are now available with white frames & neon arms. Available in assorted colors. Plastic. 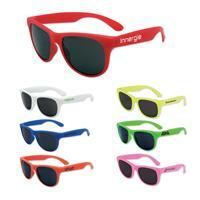 Our high quality, Iconic kids sunglasses have UV400 protection and change color when exposed to the sun. Ideal for outdoor events, schools, travel agencies and event planners. Plastic.